The demolition of a Hindu temple by a Karachi property developer is yet another reminder of how insecure religious minorities have become in Pakistan. Witnesses say the developers moved in early on Saturday - when higher courts were closed and there was no hope of immediate legal redress for those affected. 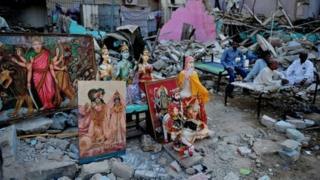 The community has set up religious articles, including pictures and statuettes of their gods, in the midst of the rubble of the demolished temple. But will they be able to fend off a construction giant in a society which is increasingly unsympathetic to its tiny Hindu minority? "First, a few men came to the temple and said they just wanted to visit the site," says Mukesh Kumar Jaidia, a resident of Doli Khata where the temple was located. In recent years there has been an increasing trend among Pakistan's Hindus to migrate to other countries. Many feel that existing laws have proved inadequate to protect their right as the equal citizens of Pakistan. "Then some more men came, followed by the police and bulldozers. They erected a canvas fence around the temple and about four adjacent houses, and before we knew it, they were bulldozing the structures." The Rama Peer temple, which some say was 80 years old, was one of many Hindu temples in Karachi that have in recent years been the subject of property disputes involving commercial builders. The compound where it was located, and the land around it, is owned by the military. In 2008, the military estates officer (MEO) of the area issued eviction notices to the temple and more than a dozen Hindu families residing in houses built around it, to clear the way for its purchase by a major construction firm based in Karachi. "The residents refused, saying they had been living here for more than 50 years and had a right to be offered ownership rights for a price instead of being thrown out," says Dr Ramesh Vankwani, the head of the community organisation, the Pakistan Hindu Council. A plea filed by one of the residents was dismissed by a court in November, paving the way for the construction firm to forcibly evict the residents last Saturday. The community staged angry protests on Sunday, saying the demolition squad had desecrated their articles of faith and deprived several poor people of a roof over their head. The Hindu-Muslim animosity dates back to 1947 when India was partitioned on communal lines to create a Muslim-majority Pakistan. Most upper caste Hindus left Pakistan for India, leaving behind low caste Hindus who were largely poor and uneducated and performed menial chores. With the advent of Islamic militancy in the 1980s, this vulnerable section of society has grown even more insecure. In recent years, the community has faced a spate of kidnappings and forced conversions of their women by Muslim men, often backed by organised vigilante groups. The capacity of these groups to intimidate the minorities and their supporters was in evidence in February this year when a 17-year-old Hindu girl, Rinkle Kumari, went missing from her home in Mirpur Mathelo town of Sindh province, and resurfaced at a shrine run by a locally influential Muslim family. The armed followers of the shrine fired celebratory shots over what they called her conversion to Islam and her marriage to a local Muslim youth. While she stated in a court that she had converted of her own accord, her parents said she had been intimidated, and that she had actually been kidnapped from her house by four armed men. Human rights groups say there are dozens of cases of Hindu girls having been kidnapped and converted to Islam, mostly in Sindh province where the majority of Pakistani Hindus live. The wealthier among them - especially those in business - also make easy prey for extortionists and criminal gangs involved in kidnapping for ransom. Their places of worship are being treated with equal disrespect. When Hindu extremists razed the Babri mosque in Ayodhya in northern India in 1992, Muslim mobs in Pakistan responded by destroying dozens of Hindu temples and Hindu settlements all over the country. Sporadic attacks on Hindu places of worship have continued ever since. In May, unidentified men vandalised a 19th Century temple situated inside an archaeological compound in the north-western city of Peshawar. They burned down the holy scriptures and images, and smashed the idols. While the Pakistani statute books still carry laws from the colonial period that prescribe punishment for the desecration of religious places and articles, their enforcement has come to depend on how far a community is willing to go to make those laws work. In Karachi's Doli Khata area, the socially weak Hindus will be up against influential builders, a powerful office of the military estates and a public opinion largely influenced by hostile Islamist groups.